This post is the second in a weekly series that will highlight things that you will need to know about new features in BizTalk Server 2013. This week, we will examine a subtle change that didn’t even make the new features list, but could change the way you configure your X12 integration solutions. Many of you who had previously downloaded and installed BizTalk Server 2010 CU3 did so to take advantage of a nice new feature in that CU — namely the ability to Generate 999 acknowledgements (in place of the already generated 997’s). The process for generating 999’s with CU3 was not necessarily intuitive, and somewhat limiting. It involved creating a custom pipeline with the EDI disassembler and toggling the Use 999 Acknowledgement instead of 997 property (that only shows up in the pipeline designer) to True. While this was a huge improvement over some of the quickly hacked together solutions that had sprung up to tackle this challenge in the meantime, it was still lacking. What if I already had lots of different semi-customized pipelines that needed this change? What if I want to use the same receive location to receive messages from multiple parties that will each have unique requirements for the types of acknowledgements they receive? Then I had some challenges ahead of me that were pretty boring at best, and/or unhappy and non-trivial at worst. In the end, the setting of using a 999 (as opposed to a 997) wasn’t really tied to a particular agreement or business profile, and it required custom development to implement. Both of which, could have been better. Another thing that you will notice in the list, is that it lists both the 4010 and 5010 versions of the 997 as well. As one might expect, these same selections are also available to be configured at the Business Profile level as well. This is definitely welcome change, that will hopefully serve to prevent the spread of developer heartburn. Not only does this make an existing feature (since 2010 CU3) more visible, it also makes it more flexible and eliminates the requirement for custom development / deployment. This change alone – which didn’t even make the list of new features – may make it worthwhile to upgrade (depending on the complexity of your existing and upcoming X12 integrations). If you’re just now starting the journey using BizTalk Server to tackle your X12 or EDIFACT integrations, and need a place to start, be sure to check out QuickLearn Training’s BizTalk Expert Series: EDI class. If you’re new to the BizTalk world, you have some time before the next EDI class to get into our BizTalk 2013 Developer Immersion class, which will take you from 0 to creating enterprise-scale integrations in 5 action-packed days. Steps How to generate 999 Ack from Biztalk 2013. 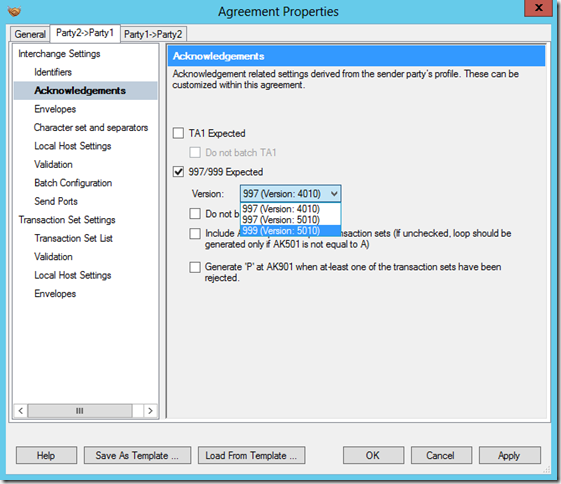 1.In party agreement in first tab (Party2-Party1 (sender to receiver).Select Acknowledgements in this set 999-5010. 2. create one send port and assign filter BTS.MessageType == http://schemas.microsoft.com/Edi/X12#X12_999_Root . 3.Select EDI send pipeline in send port and configure the path where you want to create 999. 4. 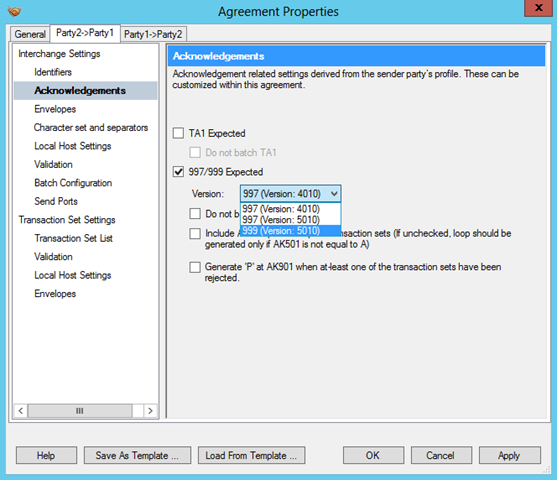 In party Agreement Second tab (Party1-Party2(Receiver to Sender) in envelopes set repetition separator and 00501 version (Sender TAB) not more then that header value should be in 5010. 5.Restart the hostinstances and drop the file .